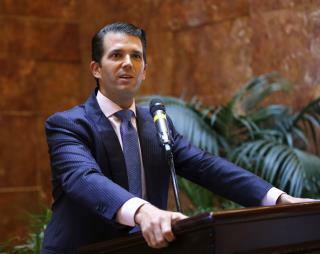 (Newser) – Donald Trump Jr. has revealed the real reason for his meeting with a Russian lawyer last year: He says Natalia Veselnitskaya told him she had information that could help his father's campaign. In a statement Sunday, Trump Jr. said during the June 2016 meeting, the lawyer told him "she had information that individuals connected to Russia were funding the Democratic National Committee and supporting Ms. Clinton," but failed to provide any details. Multiple sources tell the New York Times that Trump Jr. only agreed to the meeting—which was also attended by Jared Kushner and Paul Manafort, Trump's campaign manager at the time—because he had been promised damaging information on Clinton. ...and if Chelsea Clinton did the same thing she would be praised for something.